Once, comics were done with a very short list of materials. In many ways that was an appealing aspect of them, and it’s still possible today. But, our options have greatly expanded. And if you think of Sequential Art as more of a system to tell stories by juxtaposition, what you juxtapose could be something else entirely other than drawings! So, first, i’m going to list our first class must haves! I’ll talk a bit about tools in the first session, and based on that you’ll know what other tools you might need to pick up. Marker Paper – Thin [13.5lb]: Strathmore makes a good 13.5lb pad. It has the transparency you need for tracing while being great for working in pen and ink as well as pencil on. Cartridge Paper: The same kind of paper you use in a jet printer or copier, pick up a ream of 500 from Staples! Prismacolor Col-Erase Colored Pencils: They sell them in packs and as singles at DeSerres so you can pick your own colours. I suggest blue or light blue, but NOT the non-repro blue! – TOO LIGHT. I also use red & orange and sometimes green! You’ll probably want at least two of a light colour like Light Blue, and two of a dark colour, like Red. Mechanical pencils and leads: – I suggest HB. 0.5mm or 0.7mm. Or good wood graphite pencils. Again HB, but if you can afford it get one of each from 4B to a 2H. Erasers! : One kneadable & One white plastic. You will want both. Ok, here’s the fuller lists for the whole course. For Making Comics, even if you work mostly in an analog mode with pencils and paper, it’ll be useful to be able to scan your art to make blue lines. And we’ll talk about lettering digitally, and a little bit about colouring in Making Comics. For Intro to Cartooning, all our studies and drawing can be done digitally with a good tablet capable of pressure sensitivity; or with a lightbox; or the thin 13.5lb marker paper listed for tracing below. Any one of those three will do it but you’ll must have at least one! Making Comics 101 and Intro to Cartooning will be taught using traditional ways and means, I don’t draw digitally myself so I don’t instruct digital drawing. That said I think it’s possible to do all the work for both courses with a good tablet that has good pressure sensitivity. And you’ll need software that allows you to work in layers. I’ve used Photoshop forever, it’s not as affordable these days. but for the moment CS2 is available for free! – read this for how to get it!! The open source program GIMP is also free, as is the fully featured and much more easy to use open source Krita! A paint program with most of the functions of Photoshop. Another option is the Affinity suite, a full line of programs to challenge Adobe including a PS like image editing program with layers as a function. I recommend also taking a look at Manga Studio as well. You can download it to use for a month before spending any $ to try it out. It’s become very popular and is the only program out there made specifically for drawing comics. All of these will require a pen tool to use. Wacom makes the best but there are a lot of decent cheaper options too. Drawing tools for Making Comics & Intro to Cartooning! Prismacolor Col-Erase Colored Pencils: These are NOT pencil crayons! They sell them as singles as well as in boxes at DeSerres so you can pick out your own colours. I suggest light blue but NOT the non-repro blue – TOO LIGHT. I also use red and orange sometimes! I use these for penciling so get at least three for the course. Do not try to substitute regular colored pencils for these. You will need a Sharpener; I recommend the Palomino-KUM Long Point Pencil Sharpener. Generally getting a better one will save you $ on the pencils themselves. Mechanical pencils and leads – I suggest HB to 2H range. It’s possible to get blue erasable led for technical pencils too. But I find it fragile and not very good so i recomend 2H, HB and 2B leds, if on a budget, then just HB leds. Erasers: One kneadable & One white plastic. You will want both. Pentel Correction Pens! There are other correction pens around, but not as good as these at all. I’ve picked up Prestos at De Serres and Staples. And saw bins full of them at Librairie Jasmin co-op UQAM! Pigment pens: Comic artists generally use these a lot, one of my own core inking & lettering tools. These are MANDATORY for both Making Comics and Intro to Cartooning. There are several brands to try ranging from about 3 to 5 dollars each. DeSerres has all of these but i’ve linked to Jetpens on the site here. Faber-Castell Pitt Artists’ drawing pens are popular with many. And there’s a line of ‘Multiliner’ pigment pens from Copic. Pigment pens traditionally come in a range of sizes, for the class, get at least one 02, 05, and 08. Or a Super Fine, Fine & Medium. Coptic, Micron & Faber-Castell make them as felt tipped brush pens too. Markers! Sharpies, a standard tip, fineliner, and wedge. Other kinds of Permanent markers are also usable, but I always find Sharpies to be versatile and hardy. I don’t draw with them often, but I use the big wedges to fill blacks a fair bit! Marker Paper – Thin [13.5lb]: One way or another you will want to be able to trace things, over your own rough drafts not least of all. Tracing paper is no good for ink, if you spring for a lightbox or work digitally [in layers] you can do it that way. But the best low fi alternative is using very thin 100% cotton Marker Paper. Strathmore makes a good 13.5lb pad. It has the transparency you need for tracing while being great for working in pen and ink as well as pencil on. DeSerres has the Strathmore that I can recommend. Note that some thicker papers are also called ‘marker paper’, make sure whatever you get is this and smooth to the touch, and you can see your finger through a single sheet when pressed against it from behind. Bristol paper, Smooth: I ink, and do washes on Bristol. It’s possible to ink on Marker paper as well, but if you are interested in traditional mediums or doing work with wash, Bristol is much better. I work on different sizes myself, but for the course i recommend a pad of Strathmore Smooth Bristol, 300 series or higher quality. Fabriano’s Bristol is not bad at all. And i’m liking Canson’s Foundations Smooth 100lb. There are a few other brands, feel free to try them but I know for a fact those are best for inking. You can also get smaller pads, but 11″x17″ gives you the option to print large blues for the class, or cut it down to two sheets of 8.5″x11″ which you can run through the manual feed of your own desktop jet printer to print blues at home which is very handy. Cartridge Paper: The same kind of paper you use in a jet printer or copier, pick up a ream of 500 from Staples! A lot of thumbnailing and sketching, character design and general thinking out of cartoons and comics can be done on this cheap kind of paper. It has limits but for basic pencil and ink work it’s a perfectly viable medium and will let you save your bristol for the final drawings and best work. If you want to work larger 11″x17″ reams are still very cheap! Mastering our craft means a lot of drawing, so having lots of cheap paper on hand is important! Rulers! It’s good to have a few. I strongly recommend the first 4 kinds mentioned here: A medium size T square – 30 inches will do. A straight ruler that is at least 18 inches long. I have a few short ones as well but you need at least one that long for working on full size art. A set of french curves or bendable ruler, and a 30-60-90 set square. Non critical, but It would probably help to pick up a circle and ellipse template or two, too. A Compass with ruling pen attachment or pencil holder is also often super useful. And, I do recommend getting an Ames Guide as well, for lettering by hand. OPTIONAL BUT RECOMMENDED: If they work on paper every cartoonist NEEDS a Light Box sooner or latter. You can make one, or buy them. It used to be and still is true, that some are pretty expensive. DIY light boxes can be very affordable and if your light is bright enough pretty effective. I’ve built two myself. But recently I ordered a $26 LED one from Amazon, and it’s really very effective as well. For ease and price that would be my first recommendation. A traditional Light Box around the same size goess for about $70 at deserres. To go the DIY route, there area lot of options. Depends on how much Light Box you think you’ll need? I like this easy DIY version with a binder, clever AND portable! 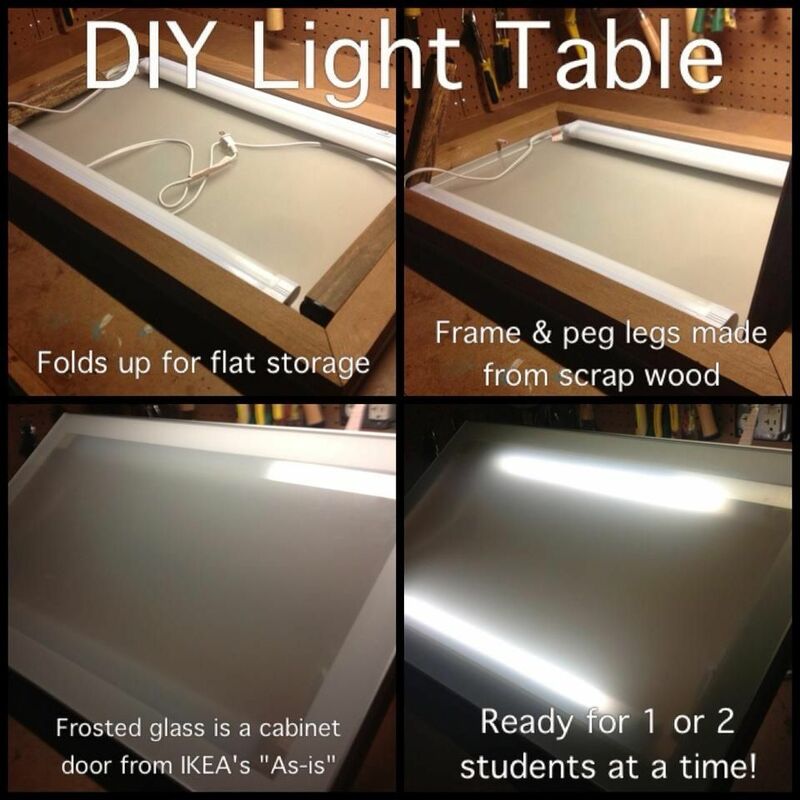 You can make a simple working home Light Table, using a glass table, or a cardboard or plastic box with a sheet of Plexi or glass in place of it’s regular lid to give you a better working surface. And some kind of bright light source you can safely place under or in it for the light. You can also get a little more adventurous, and make a wood box for it, or use one of these cheap ikea tables, or like this, this maybe, or one like this? OPTIONAL – White Gel pens are handy for details in white ink sometimes. Personally use Uni-ball Signo Broad UM-153. OPTIONAL – Traditional nib Inking Kit: Pick up a pack of Zebra G-nibs, or not as good but Speedball Nibs are used by many and some recomend starting with a DELETER Trial Pen Set; Some good indian [I use PEBEO Graphic India ink myself], or acrylic inks; A good nib holder. Nothing fancy needed; A small sable brush, Winsor Newton is the go to brand, but I like using sumie style sable brushes a lot myself and they are a bit more of a deal often. Grab a #2 or #3. Or both; And a bottle of Bleed Proof White, I like both those made by Daler-Rowney & Dr.Ph.Martin’s. Also good to have is a small container to hold rinse water, and a pallet or Inkwell. OPTIONAL – Brush Pens: We will cover a little bit of traditional inking with brush, generally i no longer use dip brushes often myself though. Instead i recommend brush pens! Felt brushes are a bit easier to use the first time, but lack some of the subtle range of a hair brush. I’ve been testing several, but my all time favorites are synthetic hair brush pens. The best of those for under or about $20, is the A Pentel Pocket Brush [comes with two refills]. FYI DeSerres DOES stock usually these, but they don’t keep them with the pens. Ask for them in the calligraphy section. Designed like a fountain pen with a replaceable ink cartridge. There are a few cheaper models made by Pentel, but the ink in them is not waterproof so not as good for inking unless you order the Pigment Ink version. The next step down in price and quality is a top end felt tip Brush pen. I’m told the Zebra Disposable Brush Pen is one of the best, and I’ve used Faber-Castell’s. The felt version of the Pocket Brush is pretty good too. And I really like the Sakura Pigma Professional Brushes, great for inking comics! OPTIONAL – Sketchbook: There is a lot of note keeping sketching and rough thinking out of things in planning comics, and you want a single place to keep all your development work. So get a dedicated sketchbook for this. A good size is a classic 8.5″ x 11″ hard cover or spiral student sketchbook. larger can be good though as well. OPTIONAL – A sharp X-Acto, Pocket or Utility Knife. OPTIONAL – Ballpoint pens, and Felt tip pens in my kit and always recommend them. Handy for a number of uses. Not really a good replacement for Pigment pens, but if you’re just drawing for the first time or casually sketching on the go, both can be excellent. You’ll see I often link to Jetpens on the site. Mostly because they don’t break the links so you can see what the things look like. They have pretty good prices, and if you buy a bunch of things shipping can be decent. But It takes a while to show up I find. Local is better, I don’t know ALL the art supply stores in town but i’ve tried to research a few, I recommend calling ahead before heading out, to see who has what where? First, I’d recomend La Co-op Saint-Laurent des Arts, they have one of the best selections of exactly the tools I recomend at good prices, especially if you become a member there. Other options include DeSerres all over town, big shops and generally broad rage of stock, but can be hit and miss on having things in stock and staff only know their own sections at best; La Boutique des ARTS de la Coop UQAM where with a membership their prices are a tad cheaper than DeSerres generally and well stocked shop for such a small one. Around the corner from it in the same building/underground complex is Librairie Jasmin co-op UQAM! Great for things like the Gel Pens and Presto Correction Pens. Brush pens and nice sketchbooks can also be found at Au Papier Japonais, and Nota Bene Papeterie has some very nice sketchbooks and a great selection of pens! And Encadrements Des Cèdres is a nice shop as well. I hear Avenue Des Arts in Westmount can be good, Kama Pigment for pencils and paints and a small drawing supply section, and if you’re a student at concordia they have a decent Art Supply Store worth checking out too. Again I suggest calling ahead for all of these to see who has the things you need before visiting them, saves time. Also several of the items, like gel pens, mechanical pencils and correction pens, can be sourced at places like Staples!